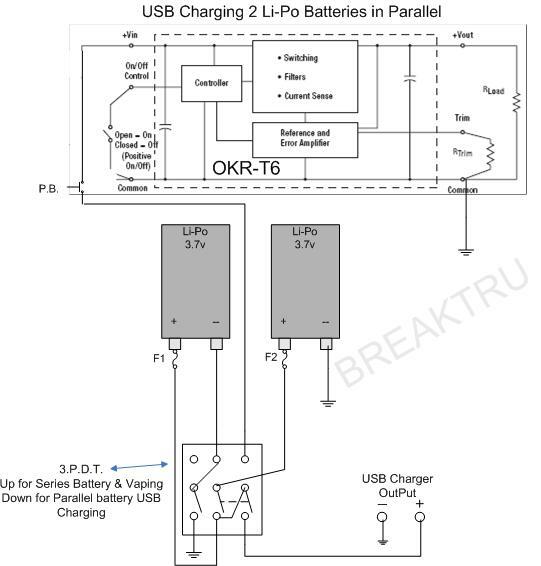 Breaktru Forum | eCigarette Forum | Battery | Topic: USB Charging 2 Li-Po Batteries. Running two Series Li-Po batteries for powering an OKR-T/6 or any other regulator that requires 2 series 3.7v batteries and charging them in parallel w/ a USB single charger circuit Takes about 4 ½ hrs @ 500mA. Not much different than the charge time for two 18650 on a standard Li-Ion charger. The circuit will place the Li-Po's in series (8.4v) when the 3PDT. switch is in the UP position and the Li-Po's will be in parallel with the 3PDT switch is in the DOWN position which also places the USB charger on line. The 3PDT toggle switch rating should be 3A or better. The charger has a "Smart" chip MCP73831/2 which Pre-Conditions the batteries. during high power or high ambient conditions. Re: USB Charging 2 Li-Po Batteries. I was wondering if anyone was going to attempt this. I've though about it a bit. I was thinking in terms of a MOSFET array to automatically switch the cells back and forth in as required. There's a couple issues with that. One is the controller needs to be powered full time and the other is dealing with the potential for high equalization currents when the cells are switched to parallel. It can be hazardous for a LiPo. I read about a guy who blew one up when connecting cells in parallel for charging. LiPos have very low internal resistance and it only takes a small differential for a lot of current to flow. Maybe a PTC fuse or two USB chargers could be employed for protection against that. As far as your approach, I'd get rid of the diode and replace it with another pole on the switch or a MOSFET. Diodes are lossy and Zeners are even more so. Keep in mind the forward drop on a Zener is pretty much the same as a standard diode if not a little higher. Add a PTC fuse between the cells on the parallel connection to protect them from high equalization currents. Or, rather than connecting the cells in parallel, use an isolated USB charger controller on each cell. Very good Craig and thank you very much. I was trying to use the single USB charger I already had and would like to install it inside the mod (small package). Good advise about another fuse between the batteries. How about on the "+" of the second battery. Can I leave the Zener for blocking voltage below 6.2v in addition to the extra pole on the switch? Lossy meaning voltage drop? This Zener (1N5341BTPMSCT-ND) has a 1.2v@1amp, does that mean it will drop 1.2v? A design like this kind of burns brain cells to think about so I haven't actually fleshed out a circuit like you have. As far as I've thought about it, you should be able to stick a fuse between the positive terminal and switch on one of the cells to keep them from swapping too much current. You could probably just put it in line with the positive terminal on one cell and the switch. It could do double duty in protecting from high equalization currents as well as a backup for protection against atomizer shorts. Basically, just relocate the fuse already shown between the cells. Forward voltage of 1.2V at 1A is pretty high. With a 1A supply current you're looking at power consumption of 7.4W (based on nominal battery voltage). You'll be losing 1.2W at the diode. That's a 16% loss in efficiency which is large. Get rid of the diode and use a MOSFET slaved to the switch or another pole on the switch. I like the idea of Parallel charging. Nice way to do it. Looks like it would work. I believe this would remedy the balancing of two unequal cells. I'm going to attempt this circuit for my mod. Where did you get the 3PDT switch? And what USB charger circuit are you using? I would imagine it would take awhile to charge. Have it wired up in a new mod. Haven't completed it as yet. Spring is here and have lots of outside chores to do. Been refurbishing my Bar-B-Que. Did a MacGyver on the Dip pan. Wasn't going to spring for $85 bucks for a new one so a piece of sheet aluminum, shears, hammer & dolly for shaping it did the trick. You would think an $700 B-B-Q would last forever. Had to spring for another $250 for new parts. PTC over-current protection / reset-able fuse. What happens when you use a 4a or 6a trip rated PTC on a circuit board. The weakest link would be the trace on the board. However it is not always practical to use a wide enough trace when using a 6a trip rated PTC. 0.150 is a very wide width and would require a lot of realestate. I try to use a backplane for all my ground/neg connections and a frontplane for my positive connections distributing the higher current paths. Even with this said, there is always a weak point as I discovered the hard way. I blew opened a narrow point in the trace when I first connected my batteries. A heavier jumper wire fixed that. Completed the charging circuit as shown in the Original Post with 2x 20c Li-Po batteries and put the half charged batteries on charge. After two hours the charger red LED extinguished and I measured 4.19v on each cell. So far so good. This is a single-cell charger, so it won’t work on batteries in parallel. The only gotcha is that you’ll want all the batteries you have in parallel to be fairly closely matched. They should be the same capacity, and preferably the same age. If they’re mismatched, the charger will get false indication of full charge and won’t charge the entire stack properly. Bitchen, always nice when that happens. BTW, I've burned a few circuit traces in my time. I copied your design and I must say it works quite well. So say I wanted to run a 2400 mah 3.7 mod with 2 1200 mah batts in parallel the spark fun charger would charge them no problem? so you have had it together for awhile...do the batts stay balanced...? Putting the switch in Parallel mode for a few minutes seem to be balancing the batteries okay and do it before putting it on charge. Haven't had any issues. Been lurking around and reading for about a day. I must say I love this forum. I'm currently working on putting together a schematic and parts list for my first box mod. I wanted to incorporate this switch, but as a 3P3T with the center being completely off. Needless to say I'm a complete newbie to switches that are more complicated than a momentary or a simple on-off toggle. So I would appreciate any guidance on how to substitute a switch like that into the above schematic. I think I have it down. Can someone look it over and let me know? Check it thoroughly before attempting to connect the batteries. Thank you very much. I like this idea more than a separate on/off switch honestly. Unless that approach would be safer to implement along with the first schematic. Yet another question from a noob. If this were hooked up to a okr-t/10, wouldn't the contact current rating have to be 10a to support the max output capabilities of the okr-t/10? edit: Nevermind, data sheet on the converter states maximum input current is 4.53amps, I'm still guessing I'd want a contact current rating of at least that right? The above is more of a guess than an exact calculation. You would have to find the datasheet with the Load Limit Curve chart which I can't find for that switch. Ahhhh... so it all comes back to watts! Thank you. Ratings for DC switches typically come down to power. However, as Breaktru pointed out, switches do not handle power in a linear fashion. The ratings are provided in terms of a single point with a voltage and amperage. You can multiply the two for a pseudo power rating. However, keep in mind that it's going to change an amount based on applied voltage. There's a point where the switch hits a current limit regardless of applied voltage. Unfortunately, absolute maximum currents are not provided for DC switches. It's pretty much a guess. Switches for AC applications are typically rated in VA which is a power rating. Those are normally intended for a particular voltage like 110AC or 220AC so they're more constrained in that way. Even the industrial ones used for voltages in the kV are rated in VA, but they're still constrained by a voltage rating. It's a pretty safe assumption that a switch rated for 3A and 125V can handle 6 Amps and 8 Volts. Is is possible to just break the + to - connection of the series batts then have each battery individually wired from the usb board effectivly parallel charging while breaking the series connection with a spst switch? Not too sure if this senerio would create a short in series having the parallel connections still hooked up through the usb board while in series to run a vmax chip. You need to switch the batts from series to parallel to charge both cells with a USB charger. That's the function of the drawing in the OP. However, you can not leave the charger connected when engaging the + to - connection on the cells. It would create a short circuit. This is why the multi-pole switch in the OP is required. Using one or two USB charging boards makes no difference. There's number or ways to charge two series cells without reconfiguring them. Use a virtual ground with two USB charger boards. In that case, you need two separate USB power supplies. Use a boost converter on the 5V USB input and raise it to 9V which would allow the use of two boards with a virtual ground requiring only one external connection. Use two boards with a virtual ground and a 9V power supply requiring a different connector type (typically a barrel connector). Use a balance charger with a charging header externally accessible. The first three things I mentioned are too convoluted. Really the best and only way to charge series cells without reconfiguration is to use a balance charger with a charging connector built into the mod. Other than that, a series-parallel switch with a USB charger is the next best option. One big disadvantage with reconfiguring the cells is you can't charge and vape at the same time. Though it would be possible to devise a solid state switch array that automatically reconfigures the cells, but again, you're getting into a design that's too convoluted. The advantage of a balance charger connection is you save a bunch of space by removing the requirement to build charging electronics into the mod and you can charge and vape at the same time. Of course, all of this is only a concern when using non-removable cells. My feeling is that built-in charging with removable cells is rather redundant, though people do it anyway. Not sure if it is mentioned but does anyone know what fuses are used in line on both batteries. I see an F1 and F2. Thanks in advance. I really appreciate the help. This is the last step I needed in my PTR08100W NES mod. Once I get all the parts I'll post the build if youd like. Charging and running two batteries in parallel would not require any switching. This topic is for running two batteries in series and charging them in parallel. There are no additional concerns in using a USB charger for parallel batteries, but there are concerns in general with parallel batteries. To use removable parallel cells safely you must have some kind of protection for charge mismatch which includes the possibility of a battery inserted backwards. Large equalization currents can occur between cells if they are not charged to the same level. Depending on the cells, it may not be that much of a mismatch required to cause hazardous currents. If using parallel removable cells, you pretty much have to fuse each cell individually to protect from these potential issues. For non-removable cells it's not an issue since the cells act as one once permanently connected. Also it's not an issue for protected cells since the protection acts as a fuse does. Fully charged over night but when got down to about half charge on dna 30d it says weak battery?? What if i use a relays? Just signed up to the forum on recommendation from another. has anyone come across a similar chip that is capable of managing a charge current of up to 8A? Charging batteries at 8A? or a regulator capable of outputting 8A? Sorry BKS, I don't know of any 8A charger. Maybe one of the members could help.